Halloween has got to be my most favourite time of the year and it’s also a great time for making and eating yummy treats! These Halloween cookies are absolutely perfect for any gathering or party you have planned this year. 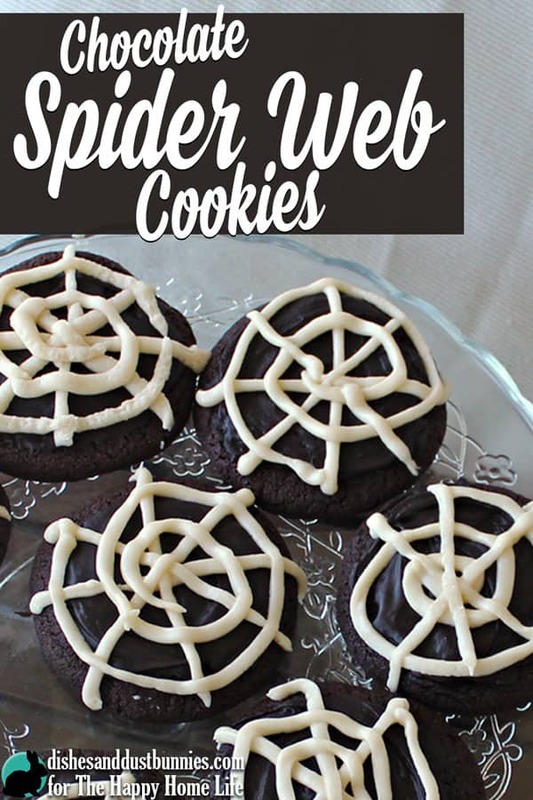 One of the great things about spider web cookies is that they look quite impressive but are actually very easy to make. 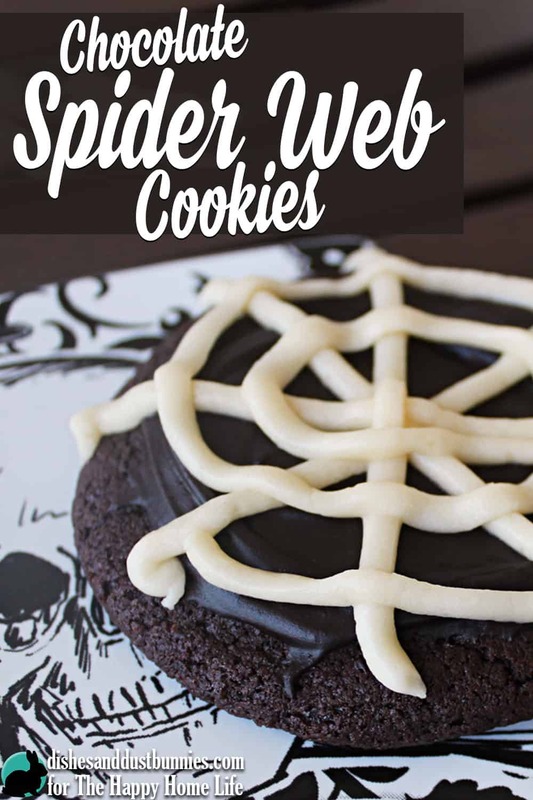 The ingredients used to make the spider web cookies give them a nice moist and chocolatey inside – which in my opinion, makes for a pretty darn good cookie! 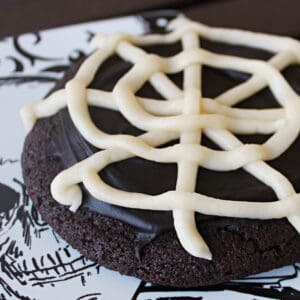 A deliciously rich chocolate frosting is spread on top of the cookies and then spider webs are drawn on top using a piping bag or a zip top bag with a small hole cut on the corner. 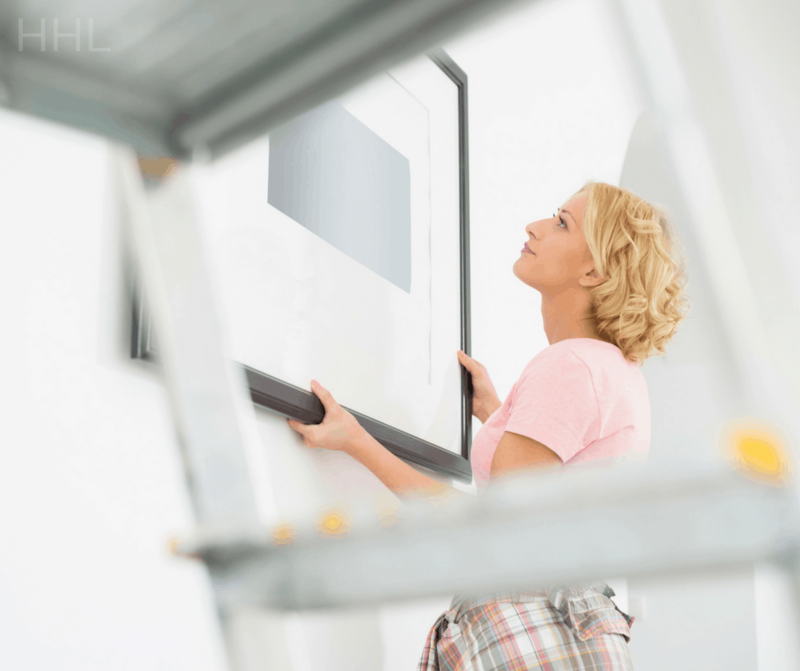 The web designs are actually very easy to make on top. After you’ve spread the chocolate frosting, you just take the piping bag or zip top baggie and form an X on top. Then you make another X and finish off by creating a spiral starting from the edge of the cookie and into the middle. 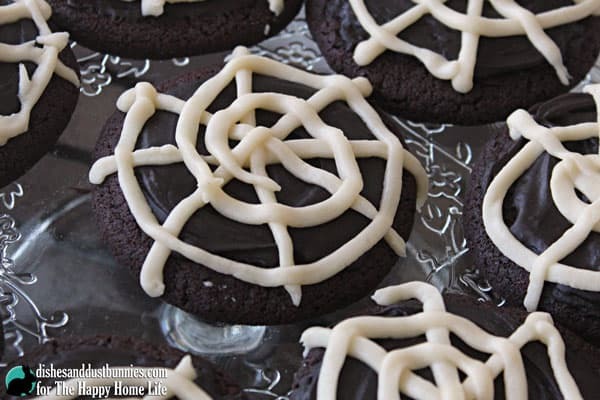 My taste testers for this Halloween Cookies recipe really enjoyed it, so I know you will love it as well! 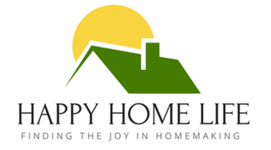 If you enjoy this recipe, you can also find more great dessert ideas from Dishes and Dust Bunnies by clicking this link! Form the dough into balls roughly the size of golf balls. Place 6 balls evenly spaced onto a parchment paper lined cookie sheet and bake for about 12 minutes. Once the first 6 are done, then the next can go into the oven. It’s important to avoid crowding the cookie sheet so that the cookies don’t all become 1 giant cookie. It’s a good idea to have 2 cookie sheets on hand so you can get one ready while the other ones bake. Once cookies have cooled completely they can then be decorated. In a small bowl heat up the chocolate frosting for about 30 seconds in the microwave and give it a stir. If you need to heat it up a bit more that’s ok but keep your eye on it since you don’t want it to burn. Onto each cookie, spread about 1 1/2 tbsps of the chocolate frosting. 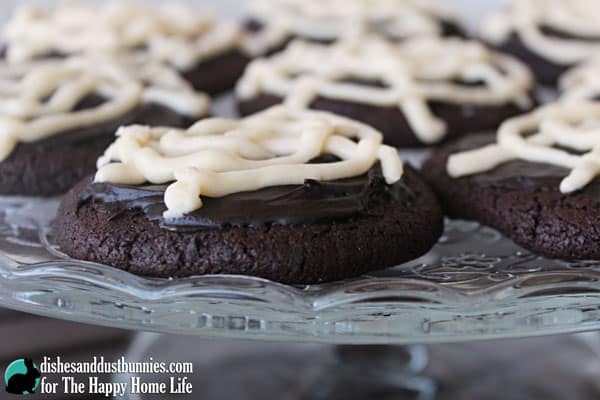 Allow the frosting to cool on each cookie. Into a medium sized zip top bag, spoon in the vanilla frosting. 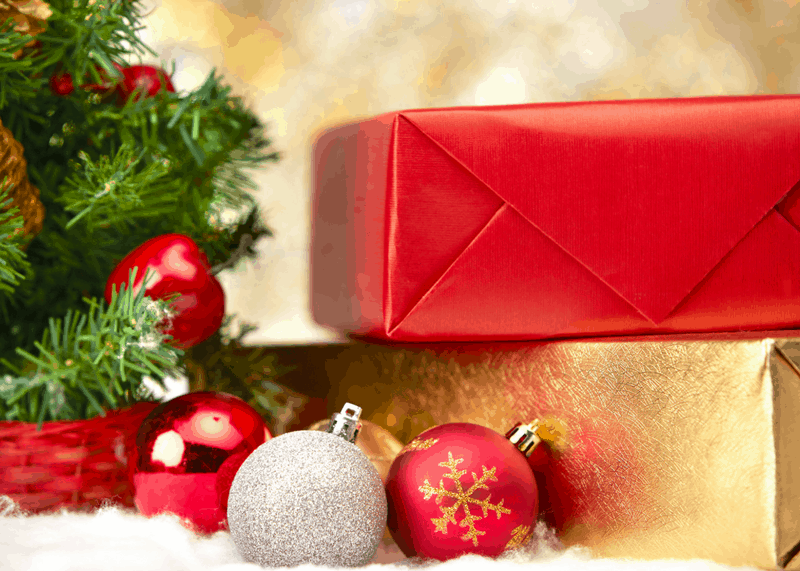 Place the bag in a microwave safe dish or bowl and heat the frosting for 30 seconds to warm it up. Form the bag into a cone shape and cut a VERY small hole at the tip to allow the frosting to come out. 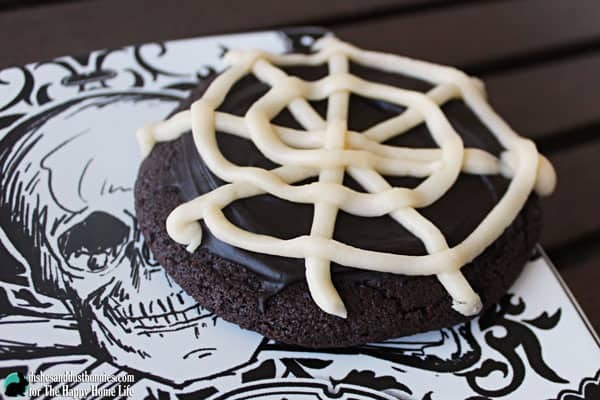 To make the spider web shape start making an X on top of the cookie and then another X. Then make a spiral on top of the X’s moving from the edge of the cookie to the middle. See photos for reference. Combine all ingredients for vanilla frosting in a large mixing bowl using an electric mixer. Start on low speed and gradually move to a faster speed once the ingredients begin to combine. Now that my son loves naming all things Halloween (witches,zombies,spiders) he would love these after school. It’s so simple even i can make them.